Butler, Party of 4: Favorite Things Party!! Isn't that a fabulous idea for a fun holiday party with the girls?? Do you have any fun holiday party ideas? That actually sounds like a fun idea. I love sharing and exchanging items. I'll be hosting a Christmas cookie exchange party so I'll be looking forward to that. This is a great idea!! 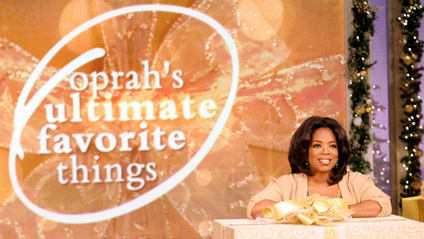 <3 Oprah! That is such a good idea that I literally just starred your post in my Google Reader to remind myself to follow up on it! Unfortunately I've already started shopping for $7+ gifts this year, but maybe next year! That sounds so fun!! I wish we lived closer and were friends in RL haha I host a cookie party ever december, so I'm getting pumped for that. Lots of mimosas and yummy treats. Have fun! We did this last year and had such a great time with it! How about y'all invite me to your cookie parties and I'll invite y'all to my favorite things party?? I know, I wish all my "blog friends" lived closer!! How fun!! I am sooooo excited! Now, to find the perfect gift! :) I have too many favorite things! I hosted a favorite things party in October and it was SO much fun!! Enjoy! Our Christmas Décor So Far…. Financial Advice for Young Couples! A MUST READ!! Thanksgiving Edition: What I wore! Thanksgiving- A Week of Workouts! Fall Colors & a Facial! Food for Thought Friday: Are you THANKFUL? How do you split household chores?? The Duggars 20th…and undeserved judgment. 26.2….Because 26.3 would be crazy! !